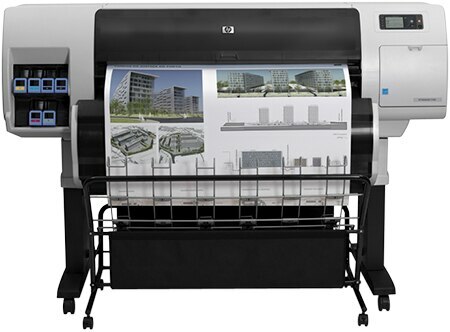 HP Launches the World’s Most Secure Large Format Printers for GIS Mapping | Industry Analysts, Inc.
PALO ALTO, Calif., January 30, 2018 — HP Inc. today introduced HP DesignJet T1700 printers, next-generation 44-inch solutions for CAD and geographic information system (GIS) workgroups to produce highly accurate documents and maps with powerful processing and a new level of security. New added features on the HP DesignJet T1700 make it the most secure large format workgroup printer available today1. The improved security is designed to help enterprises print CAD and GIS applications while protecting printers and data from unauthorized or malicious access in infrastructure construction, urban planning as well as utilities industries such as oil, water, gas, and electricity. Features include a new self-encrypting hard drive on the printer ensures it is only readable by the printer itself, even if removed from the device. For additional device security, HP Secure Boot ensures BIOS protection, and Whitelisting3 only allows approved firmware to be installed and run on the device. As the first workgroup large-format printer to embed the Adobe PDF Print Engine4, it can more efficiently handle very heavy files. As a result, PCs can be freed in virtually no time to continue working. Breach Level Index 2017 H1 Report, Gemalto. The Whitelisting feature will be available in mid-2018. Requires purchase of HP DesignJet T1700 PostScript® models or optional HP DesignJet PostScript/PDF upgrade Kit. The Adobe PDF Print Engine (APPE) is Adobe’s high speed, high fidelity print platform. Version 4 extends APPE’s leading edge for print reproduction with new performance efficiencies and breakthrough rendering features. APPE 4 enables printers to increase workflow efficiency and capitalize on the profit potential of innovations in inkjet print technology. To learn more, visit http://www.adobe.com/products/pdfprintengine. HP is BACK in the A3 MFP Market and Stronger than ever – Just Ask ME (from Dex)!